WASHINGTON, DC, October 30, 2012 (ENS) – Three nuclear power reactors in the U.S. Northeast shut down Monday during superstorm Sandy, while another – Oyster Creek in Lacey Township, New Jersey – remains in a state of Alert due to high water levels in its water intake structure. “The water level rose due to a combination of a rising tide, wind direction and storm surge. While the water level has dropped since peaking earlier today, the Alert will not be exited,” said the U.S. Nuclear Regulatory Commission, NRC, which is maintaining a heightened watch over Oyster Creek and the other nuclear power plants impacted by Sandy. Exelon’s Oyster Creek reactor, which was off-line prior to Sandy for previously scheduled refueling and maintenance operations, lost off-site power last night due to the storm. The plant is temporarily being powered by backup diesel generators and a combustion turbine engine, which are providing energy for water pumps that cool the fuel stored in the reactor until normal power sources are restored. The three reactors to experience trips, or shutdowns, during the storm are Nine Mile Point 1 in Scriba, New York, Indian Point 3 in Buchanan, New York; and Salem Unit 1 in Hancocks Bridge, New Jersey. Nine Mile Point 1 underwent an automatic shutdown at about 9 pm Monday when an electrical fault occurred on power lines used to send power to the grid. “It is likely a storm-related event, but the plant’s operators are still evaluating the cause. 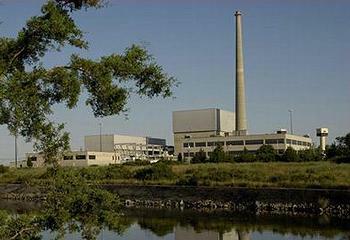 All plant safety systems responded as designed and the shutdown was safely carried out,” according to the NRC. Meanwhile, Nine Mile Point 2 experienced a loss of one of two incoming off-site power lines as a result of the fault. One of the plant’s emergency diesel generators started in response to generate power usually provided by the line. Nine Mile Point 2 remained at full power. Indian Point 3 automatically shut down at about 10:40 pm Monday in response to electrical grid disturbances caused by the storm. All safety systems responded as designed and the unit was placed in a safe shutdown condition. Salem Unit 1 was manually shut down by plant operators at about 1:10 am Tuesday as a result of circulating-water pumps being affected by high river level and debris in the waterway. The circulating-water system is used to cool down steam generated by the reactor; it is a closed system that does not come into contact with any radioactivity, said the NRC. At Oyster Creek, the Alert was declared at 8:45 pm. An Alert is the second-lowest level of emergency classification used by the NRC. The Alert was preceded by an Unusual Event at about 7 pm when the water level first reached a minimum high water level criteria. The NRC said in a statement that Oyster Creek remains in “safe condition,” with agency inspectors on site. They anticipate that water levels will “abate within the next several hours,” returning to normal levels. Due to the power outages, Oyster Creek also reported a loss of operability of 21 of its warning sirens. It reported the situation, as required, to the NRC, as well as the New Jersey Department of Environmental Protection and state Office of Emergency Management. Efforts are being made to restore all sirens to operable status. Even though some sirens are out, there are other warning systems in place, said the state agency. New Jersey DEP nuclear engineers monitor daily operations at the state’s power plants on a regular basis and will continue to monitor their status throughout the storm and its aftermath. Under the New Jersey Radiation Accident Response Act, the DEP and State Police coordinate and implement comprehensive state, county, and municipal response to nuclear emergencies and establish requirements for protecting the public in the event of nuclear emergencies.